For other places with the same name, see Fremont (disambiguation). Fremont  is a sprawling suburban city in the southern part of the East Bay of the San Francisco Bay Area; it is the 4th largest city in the Bay Area by population. Fremont is in the southern part of Alameda County, California, between Union City to the north, Sunol and the hills to the east, Milpitas and Santa Clara County to the south, and the San Francisco Bay to the west. The city of Newark, near the edge of the Bay, is surrounded by the city of Fremont. Fremont industry is not particularly large relative to other parts of the Bay Area, but neither is it a bedroom community. Many people in Fremont work locally in the electronics and high-tech industry, while many others commute to Silicon Valley or San Francisco locations for work. Fremont, however, is growing again and attracting more and larger businesses; for example, Tesla Motors has taken over the former NUMMI factory owned by Toyota and General Motors. In 2012, Fremont was ranked the top U.S. city for technology startups per capita. The city is home to one of California's "original Hollywood's", the Niles district where many of Charlie Chaplin and other silent movie era stars established their careers. 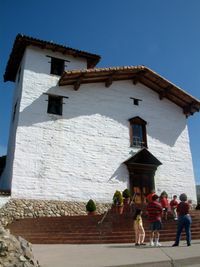 It is also home to one of California's missions, and many other interesting destinations. The City of Fremont is named after Civil War general John Charles Fremont, who prior to the war in the mid 1840s had mapped a trail to Mission San Jose to provide access for American settlers into the southeastern San Francisco Bay Area. John Fremont was one of California's first senators and went on to be the first U.S. presidential candidate for the Republican Party. Unlike most sprawling suburbs, Fremont was planned and designed to be the way it is. In the 1950s, fearing that they would be annexed by the growing city of Hayward to the north, eight very small towns decided to unite to avoid annexation. Two towns (Alvarado and Decoto) closest to Hayward quickly incorporated into Union City. The six remaining towns got together and extensively planned how things would be. Space was allocated both for industry and homes. Space for roads large enough to support the massive traffic flows was set aside. One of the small towns (Newark) dropped out of the coalition because it was slated to become an industrial zone. The five remaining towns -- (Centerville, Niles, Irvington, Mission San Jose, and Warm Springs, from north to south - annexed all the surrounding land to form the City of Fremont. The oldest of the small towns was Mission San José, named for a Spanish mission founded in 1797. When this Mission was founded it was named "La Mision del Gloriosisimo Patriarch San José" in honor of St. Joseph. It is sometimes incorrectly called the Mission San José de Guadalupe, after "El Pueblo de San José de Guadalupe" founded (1777) 20 miles south near the Guadalupe River, which became the present day city of San Jose. Fremont emerged from this history with no real downtown. The first step to creating Downtown Fremont was taken in 2014 with the construction of the Capital Ave extension to Fremont Blvd. Fremont's future downtown -- bounded by Mowry Ave, Fremont Blvd, Walnut Ave, and Paseo Padre Pkwy -- is envisioned to become a mid-density, pedestrian friendly, transit oriented development. Fremont has been multicultural since its inception, and is home to dozens of immigrant communities and a broad range of ethnicities. Today's visitor is likely to hear half a dozen languages spoken even during a fleeting trip through the city. It is said that the largest population of Afghanis outside Afghanistan live in Fremont, and it also has a large and growing south Asian community as well. Because of their entangled history and their present sprawl that makes them blend into one another, the three cities -- Fremont, Newark, and Union City -- are sometimes called the Tri-Cities. Oakland Airport (IATA: OAK) is about 20-40 minutes away by car via I-880 depending on the time of day. Rush hour traffic will almost certainly take 30-40 minutes, but most other times it is a very quick 15-20 minute drive. Or, you can take the new (2014) tram from the airport to BART--the Bay Area's rapid transit system--which runs directly to Fremont. San Jose Airport (IATA: SJC) is about half an hour away via I-880 or I-680. During commute hours the traffic can be horrific along the 880, but 680 is often faster. San Francisco Airport (IATA: SFO) is about 45-60 minutes away via US101 and SR84 (the Dumbarton Bridge), or via 101 to 84 to US92 (the San Mateo Bridge) to 880. This is the most difficult airport to get to and is also has more flight delays than other airports in the area. However, it is one of the largest and busiest airports in the world, so there are likely to be more airlines and more flight options going into and out of SFO. Avoid SFO if you can get a flight direct to Oakland or San Jose instead. There is a BART station in SFO which can take you to Fremont in about an hour and a half. The geography of city of Fremont and its street system is defined by the hills on the east side of the city and the bay on the west. Mission Blvd runs along the foot of the hills and the city is mainly on the bay side of Mission Blvd. Streets more or less perpendicular to it (e.g., Central Ave, Mowry Ave, Stevenson Blvd) have address numbers increasing as you move away from Mission Blvd towards the bay (e.g., 4000 represents the 40th block from Mission Blvd, which in central Fremont is near Fremont Blvd). Streets running more or less parallel to the hills (e.g., Fremont Blvd, Blacow Rd, etc) have address numbers in the five digits in the city, increasing as you move further south (e.g., 39000 is near Mowry Ave and represents roughly the 390th block from Lake Merritt, Oakland). Locals call streets running parallel to the hills, with the five-digit address numbers, north-south streets (although they are more like northwest-southeast) and streets running perpendicular to the hills east-west streets (more like northeast-southwest). Fremont Blvd, as you might expect, is the main surface street running the length of the city of Fremont, more of less parallel to the hills, starting at Exit 22 of I-880 in North Fremont, cutting straight through the middle of the city of Fremont, making a right turn at Irvington, crossing I-880 once again at Exit 13 in South Fremont, and dead ending in Warm Springs. In the middle part of city of Fremont, the major streets are on a grid, with Fremont Blvd and Blacow Rd one mile apart. Perpendicular to them, Central Ave, Mowry Ave, and Stevenson Blvd are also one mile apart, on the bay side of Fremont Blvd. Given the large geographic spread of Fremont, driving is the preferred method for getting around. Travel by car is also prevalent in the area given the poor public transit service to the city. Fremont streets are usually easy to navigate as difficult intersections were re-engineered for efficiency several decades ago, though some corridors such as Mission Blvd remain moderately congested but not nearly as bad as most major streets elsewhere in the Bay Area. The major freeways through Fremont are the bayside Nimitz (I-880) and the inland I-680. Although the two freeways are only a mile apart in South Fremont-Warm Springs, they do not intersect. Motorists will find travel to be very slow during commute hours in the unfavorable direction; especially so on the I-880, which is commonly said (and probably erroneously) to be one of the most congested highways in America. Mission Blvd crosses I-680 twice at Exits 16 and 12. Locals sometimes refer to Exit 16 as "North Mission" and Exit 12 as "South Mission." Fremont Blvd crosses I-880 twice at Exit 22 and Exit 13. The locals call Exit 22 "North Fremont" and Exit 13 "South Fremont." So if someone tells you to take the "Fremont Blvd" exit or the "Mission Blvd" exit, make sure you know which one they're talking about. The exit number increases as you move north. Bike lanes are present on many major roads in Fremont. For maximum safety, avoid the large roads that lead to the freeway since they are the most congested, and your bike isn't going to go on the freeway anyway, is it? The city of Fremont publishes a bikeway path on its website  showing bike paths, trails, alternate routes for bikes, and detailing which intersections are tricky or dangerous. Print copies of the map are available at various government buildings or by ordering through the web site. The AC Transit bus system  serves the city of Fremont as well as other cities in the East Bay. Bus routes and schedules are designed for the daily commuter, not the casual traveler. In the middle of the day, buses may run as infrequently as once per hour, so be sure you have an up-to-date bus schedule and know when your bus is coming. The Fremont BART station serves as a bus terminal for transferring between the various bus routes. Taxis are not common in Fremont, and you will not be able to 'flag one down' while making your way about town. The only taxi stand of note is the one at the Fremont BART Station, where typically several taxis are lined up in a queue. There are many taxi companies that service the area, however you will not find many driving the streets all day. If you need to travel by taxi, plan ahead of time and schedule a taxi with one of the companies serving the area. Broadway West, 4000-B Bay Street, (510) 683-9218, . A stage company that performs five plays every year in a very intimate setting. Expect well-performed, offbeat plays. They also hold dinner mystery theaters, and plays by local writers. 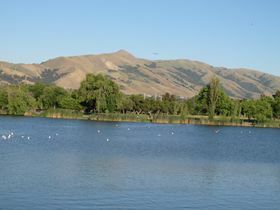 Mission Peak is visible throughout Fremont. Many restaurants cater to Fremont's large immigrant community. Chinese, Vietnamese, Indian, and Afghani food are very common. The City of Fremont provides useful maps on their website, including a downloadable Hotels Map in pdf. Get touristy by going to San Francisco via BART. Ride the cable cars from the Powell Street BART Station to Fisherman's Wharf, thereby accomplishing two of the most touristy things on the West Coast. The Oakland Museum of California  in Oakland is the best museum about California history. Take BART to the Lake Merritt station in Oakland. Exit the station to 9th Street and walk down Oak Street with the one-way flow of traffic. The entrance to the museum will be on the right side of Oak Street midway between 10th and 12th Streets. 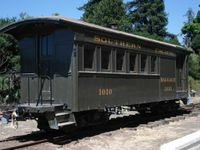 Ride the Rails to the California State Railroad Museum  in Sacramento. Take Amtrak's Capitol Corridor  train to Sacramento. From the Sacramento station, walk across the parking lot (under the overpasses) west about a block. The museum has one of the largest collections of antique trains in the United States. On summer weekends you can also catch a short steam-train ride. The museum is in Old Sacramento which provides touristy shops and food. Be careful when reading the train schedule: buses are used for some segments at certain hours, so make sure the schedule says you get a train and not a bus. See the ocean by going to the Monterey Bay Aquarium  in Monterey. It's about one and a half hours by car. A great place to both see and learn about the local ocean. After the museum, grab a seafood dinner at the Monterey Fisherman's Wharf  or Cannery Row. If you have an uncontrollable desire to swim in the freezing Pacific water, the beach in Carmel (just south of Monterey) is the place to try it. Yosemite or the Sierra Nevada in general. The Shasta Cascades region is on the way to Portland and Seattle, and includes several volcanic parks. This page was last edited on 30 December 2018, at 00:55.